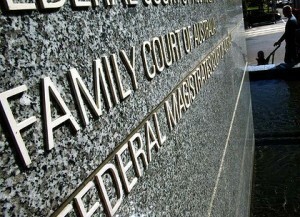 In a judgment published on Wednesday (Simic & Norton  FamCA 1007), Justice Robert Benjamin said he regularly heard cases filed in the Sydney registry of the Family Court and was “increasingly concerned about the high levels of costs charged by the legal profession in property and parenting proceedings”. He asked the Legal Services Commissioner to investigate whether the fees charged by the solicitors acting for a former couple fighting over parenting arrangements and property could constitute professional misconduct. It was unclear whether this approach was “a reflection of a Sydney-based culture” or an approach by some lawyers or a combination of both, Justice Benjamin said.”Whichever is the cause, the consequences of obscenely high legal costs are destructive of the emotional, social and financial wellbeing of the parties and their children. It must stop,” he said. The scathing comments come amid an Australian Law Reform Commission review of the Family Law Act, commissioned in September by Attorney-General George Brandis. The review will include a consideration of whether reforms are necessary to promote the “appropriate, early and cost-effective resolution” of family law disputes.Justice Benjamin asked the Legal Services Commissioner to investigate whether the fees charged in the case before him were fair and reasonable, as well as whether the legal work undertaken was necessary and performed in a “reasonable manner”, taking into account the proceedings were launched “on behalf of otherwise unsophisticated parties … and in highly emotional circumstances”. Justice Benjamin said he had read “each and every one” of the letters sent by the parties’ lawyers and some of them were “inflammatory and reflected the anger of the parties or one or other of them”.” lare not employed to act as ‘postman’ to vent the anger and vitriol of their clients,” he said.Justice Benjamin said lawyers had “a duty to minimise costs and to reduce conflict” and “some of the communications appear to add ‘fuel to the fire’ of conflict rather than dampen it down”.”The children of these parties depend upon the income and assets of their parents to support them,” he said.”Yet, in this case, the costs of the proceedings have taken a terrible toll on the wealth of the parties and consequently their ability to support and provide for their children. “He anonymised the names of the law firms on the basis the solicitors should not be punished by the negative publicity if the Legal Services Commissioner did not make a finding of misconduct.The parties’ barristers were not the subject of criticism and Justice Benjamin said he was not provided with details of their fees.